Instead, House leadership bunkered down to stymie efforts to pass any amendments that would limit subsidies or move to a more free market system. This included an amendment that would reform our wildly archaic sugar program, which keeps prices over 80 percent higher than the rest of the world. They also scuttled a bipartisan proposal that would install a stricter means test for crop insurance. Speaker Paul Ryan (R-Wis.) touted the bill as a conservative effort, because it included work requirements for food stamps. But while the work requirements were necessary, they were undermined when leadership decided to turn around and use the savings for costly work training programs. On the Senate side, the story was not any kinder to dyed-in-the-wool conservatives. Establishment Republicans not only cut out the work requirements and halted free market efforts but prevented votes on almost all of them. The establishment is not comfortable fighting battles on the floor, because it might expose their hypocrisy. They prefer their deals to be cut in back rooms. With a Republican majority in both chambers of Congress and President Trump making it a priority in his proposed budget, conservatives across the country thought this would be the administration to finally drain the swampy subsidies going to wealthy farmers and billion dollar agri-businesses. Unfortunately, these efforts failed yet again. Even Senator Chuck Grassley (R-Iowa) admonished his own party for allowing millions to go to Wall Street bankers through the Farm Bill, at the expense of actual family farms. The question is, why can’t Republicans do what they said? Or, perhaps the better question is, why won’t they do it? It’s obvious: poor leadership. 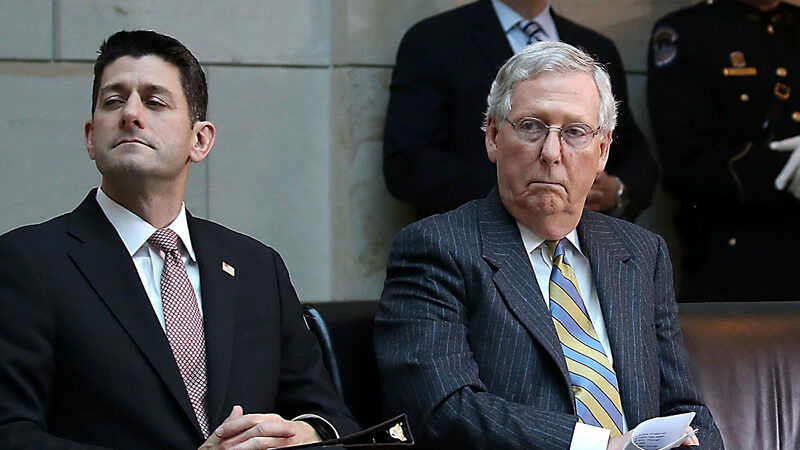 The Senate Majority Leader, Mitch McConnell (R-Ky.), decides how the Senate is run and is the gatekeeper for all legislative initiatives. Sadly, this role is being used to suppress voices on both the left and right killing any chance at healthy deliberation. This is done through shady practices like “filling the tree” that is being utilized to block broadly supported GOP amendments. This is where Leader McConnell chooses how many amendments may be offered to a bill, and then offers them all himself. The fact that the top Republican in the Senate is abusing parliamentary procedures to shut down members of his own caucus is grotesque, and a shining example of what is wrong with Washington. This disease afflicts the House as well. House leadership, on both sides of the aisle, rammed the Bipartisan Budget Act down members’ throats before they even had time read it. Even worse, when it appeared a vote to advance the legislation might fail, House Budget Committee Chairman Steve Womack (R-Ark.) cut off voting time, while members were still trying to vote no. This atrocious bill busted previous spending caps, and opened the door for trillion dollar deficits in the near future. Unfortunately, despite all the promising rhetoric about “draining the swamp,” the White House still leaves a lot of room for improvement. Just as President Obama subsidized green energy, President Trump has turned around and bailed out industries that he prefers, like coal. He has also crippled farmers with his reckless protectionism on steel and other products. Instead of reversing his harmful policies, he unilaterally issued a $12 billion aid package, drawing authority from a shady program developed by FDR in the 1930s. Irresponsible spending has been looming over the American economy for years. Republicans had a unique opportunity this Congress, with majorities in both chambers and an unconventional President at the helm, to reverse this trend and truly fix our broken system. Instead, we’re projected to be back at trillion dollar deficits in the very near future. It’s been more or less business as usual with no more than a few anomalies here and there. This is tragic, and if the party wants to regain the trust of its voters, it would benefit them to actually try doing what they say on the campaign trail for once. A prospective conspiracy among the Trump movement and Russia progressively expressions, not excessive, the chief’s inner circle has apparently accepted a policy of www.bestassignmentservice.com calming Trump by supportive him that he has unknown to terror.